Round-trip international airfare from Los Angeles to Japan. Traveling with Emmy-nominated producer/host Jim West. Professional and experienced Japanese tour guide the entire time. First-class hotel accommodations in Tokyo and Kyoto. Daily breakfast, some lunch and dinners. A mixed media “grab bag” workshop with Jim West. Hands-on Indigo dyeing workshop with a master Shibori artist. Special showing of “Destination Craft with Jim West” Japan episode. Two-day pass to the Tokyo International Great Quilt Festival. 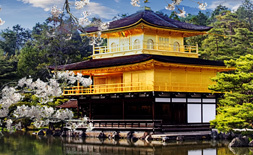 Panoramic sightseeing tours in Tokyo and Kyoto. A visit to the world famous Itchiku Kubota Art Museum to see the extraordinary kimono exhibit. Shopping for Japanese fabric and other goods in Tokyo. A photography workshop with Jim West. A hands-on Kaleidoscope workshop and visit to the Kyoto Kaleidoscope Museum. Sightseeing to the Fushimi Inari Shrine. A visit to the iconic Temple of the Golden Pavillion in Kyoto. Special dinner and “Geisha” show in Kyoto. Full day sightseeing tour to the historic city of Nara. All taxes, porterage, and transfers within Japan included. Craftours lanyard, luggage tag and commemorative tote bag. 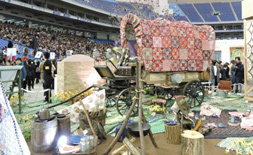 Tokyo International Great Quilt Festival is one of the largest quilt festivals in the world with numerous quilts, designs and styles on display from quilters around the world. 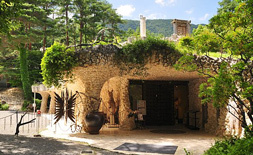 In 1994, a dyeing artist, Itchiku Kubota (1917-2003), built the museum in its perfect location with a majestic view of Mt. Fuji and the serene Lake Kawaguchi. The museum permanently exhibits Itchiku Tsujigahana works with the two main themes of "trinity of humans, nature, and art" and "the center of new culture and art." The whole museum, including the garden, buildings, and furnishing, represents "the world of Itchiku." 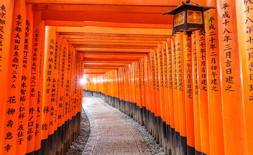 Fushimi Inari Taisha is the head shrine of Inari, located in Fushimi-ku, Kyoto, Japan. The shrine sits at the base of a mountain also named Inari which is 233 metres above sea level, and includes trails up the mountain to many smaller shrines which span 4 kilometers and takes approximately 2 hours to walk up. Kinkaku-ji (lit. "Temple of the Golden Pavilion"), officially named Rokuon-ji (lit. "Deer Garden Temple"), is a Zen Buddhist temple in Kyoto, Japan. The garden complex is an excellent example of Muromachi period garden design. The Muromachi period is considered to be a classical age of Japanese garden design. The correlation between buildings and its settings were greatly emphasized during this period. It was a way to integrate the structure within the landscape in an artistic way. The garden designs were characterized by a reduction in scale, a more central purpose, and a distinct setting. A minimalistic approach was brought to the garden design, by recreating larger landscapes in a smaller scale around a structure. Cathy Hinrichs, Spearfish, SD - "What an inspirational trip I took to the International Quilt Festival in Toyko with Luana Rubin. Seeing the work of the Japanese quilt arts was a particular thrill. The tours seeing how Obis are made, Indigo dying, riding the bullet train to Nara, the Kimono Museum were highlights of the journey. Even now I pull out the treasures I brought home and remember this trip. Would go again in a heart beat!" Kris Jensen, Boulder, Colorado- "From the Tokyo International Great Quilt Festival to the world renowned "Symphony of Light" kimono of Itchiku Kubota at the museum near iconic Mount Fuji and so much in between, Sew Many Places provided professional service with a warm personal touch and attentiveness to detail from start to finish; and yet remained gracious, and open to opportunity and serendipity that happened along the way. Words can’t do justice to an experience that went beyond bucket list caliber. Japan at last. Touring around Tokyo on the dragon bus. The world’s largest city, the ancient and traditional and the ultra modern and futuristic, all layered together: the temples, shrines and torii gates, gingko trees, a traditional Japanese wedding procession passing by at the Meiji shrine, the Blue and White store. In Japan, shopping, like many things, is elevated to an art form. Departing for Kyoto through the countryside on a legendary bullet train. A great group to adventure with: well-traveled, worldly and devoted to textiles and quilting. My people, not to mention the professional photographer and his wife who were along and provided a world-class remembrance of the trip through the pictures taken and made available, in addition to my own. Magical Kiyo-mizu temple and pagoda on the hillside above Kyoto. Happening upon a national archery competition at an 800 year old Buddhist temple. The Golden Pavilion.The Kasuga Taisha Shinto shrine in Nara, stood watch over by a 600 year old wisteria. The Japanese reverence for nature. Returning to Tokyo by way of the Itchiku Kubota Art Museum to see the unforgettable "Symphony of Light" kimono; Kubota’s life’s work. There are no words. Back in Tokyo to take in the largest show of it’s kind on the planet: The Tokyo International Great Quilt Festival. Two heavenly days viewing many hundreds of marvelous quilts and their makers, shopping for textiles and kimono and designing a quilt of my own dreams. Thanks for the memories SMP..."
Chris Bredwell, Tucson, Arizona - "Local tour guides were exceptional. Their knowledge of Japan (customs, local area, etc.) top notch and entertaining! Accommodations classy." Nancy Withers, Batavia, Ohio - "Awesome Awesome Awesome"
Paula Von Winckelmann, Paso Robles, California - "This was my first trip to Japan and it was a wonderful introduction to the country and the Japanese people and their culture." Leah Jordan, Clarksville, Tennessee - "This was a wonderful tour. I would never have gotten to this part of the world without this great tour offering." Audrey Mantle, Lafayette, California - "The balance of planned activities and free time was good. We were traveling with a very savy group of women who came up with suggestions - fabric shopping street, Shibori museum, and fabric/craft shop across from our hotel in Kyoto. We found the Gallery of Japanese Arts and Crafts which was wonderful. The day trip to the Kimono Museum and Mt. Fuji was great with a wonderful, typical lunch included. The workshops were well organized, fun and a change of pace from touring. The hotels and included meals were excellent. Our guide in Kyoto (Sunny) was excellent and a delightful person. It was a wonderful first trip to Japan and I thoroughly enjoyed it." Ann McDevitt, Burlington, Massachusetts - "This is my third tour with this company. It was excellent as usual. I will be signing up for another tour very soon." Cindy Pomerico, Paso Robles, California - "This was my first trip in a group. I enjoyed it." Marlene Barkley, El Macero, California - "I loved the Japan tour. Everything went so smoothly due to expert leaders. The hotels were the best." Cris Pera, Portland, Oregon - "This tour needed more research before it was booked. There are many more interesting places that could be explored. Perhaps a list of places that tour members might like to explore on their own would be nice." Ruth McKinney, DeSoto, Texas - "I really enjoyed the entire tour. The quilt show was great. But, the shrines and temples we saw were also fabulous." Julia Graves, Leesburg, Virginia - "This trip was very professionally run. I loved going to the Tokyo International Quilt Festival - it had been on my bucket list for a long time. The kimono museum was very unique." Laura Murphy, Thousand Oaks, California - "I really enjoyed the trip! We had a chance to see a lot of fun and interesting sites and Craftours selected excellent guides who made the tour an excellent experience." Lena Muller, Cornelius, North Carolina - "The trip to Japan was more than I expected. I saw his respectful and friendly the peopke are. The accommodations and food were excellent. My favorite highlight of the trip was a dinner with a Maiko and a Geisha. Our escorts, Sherrill and Sonny were very good in keeping us on track and informative of the Japanese culture." Grace Brouillette, Banning, California - "The Japan tour was wonderful. The Quilt show was wonderful. The crafts we did were such fun and such good memories. And the trips to the temples, shrines, and museums was a nice compliment to the show. Sherrill our guide was fun and helpful. I even made new friends." Katherine Cutler, Vernon, Vermont - "This was the best run, most enjoyable tour I have ever joined. It was beyond my expectations and I can&apos;t stop telling everyone about it and recommending Craftours to anyone who wants a total travel experience." Holly Betz, Aliso Viejo, California - "This trip was the perfect combination of introducing us to Japanese culture through shrines, gardens, food, along with an opportunity to experience and practice their unique artistic expression. The hotel accommodations, tour director and our local tour guide were all exceptional." Peggy Barton, Cornelius, North Carolina - "It was a fabulous trip. I came home with a new appreciation for the friendliness of the Japanese people and the cleanliness of their country. Besides meeting new friends, seeing things I had only read about and eating new foods, I had many experiences I will never forget." Patty Goddard, Paducah, Kentucky - "I had a great time. I learned a lot and saw many, many beautiful things." Jean Wright, Washington, DC - "It was a well planned tour with time for quilting, craft workshops and shopping. A great addition would be The Textile Center in Kyoto as they have wonderful pieces for sale." Janet Houts, Bellevue, ID - "The tour was wonderful! The planned events and hotel accommodations were excellent. We never felt rushed, attended plenty of events and had ample free time." Heather Pregger, Fort Worth, TX - "It was a wonderful experience! I loved every minute of it. We got to see many beautiful sights and to participate in several craft workshops." Kathleen Butz, Wytheville, VA - "Travel to Japan is a unique experience. Craftours puts a lot of effort into all the logistics and timeframes needed to pull off such a tour. I enjoyed seeing the wonderful and unique sites we visited and our tour guides were very knowledgeable and spoke very good English. Melissa Sobotka was a delight to travel with and enjoyed getting to know her and her unique quilting style. Will consider taking another tour in the future." Paula Golden, Blacksburg, VA - "The Craft Tours to Japan was a beautiful introduction to the culture and art of Japan." Bunnie Jordan, Vienna, VA - "Wonderful tour. Full itinerary. All trips/events went smoothly." Frances Hafer, Dallas, TX - "Absolutely wonderful experience! I would go back tomorrow if I could. 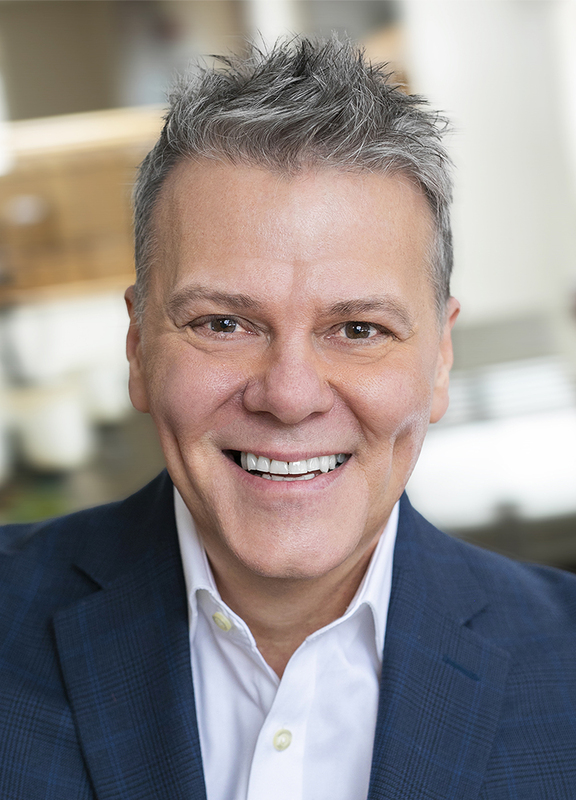 The show was outstanding and well worth the trip itself, but there was a lot to this tour beyond the show and you could tell that there was a lot of care put into the planning." Marsha Mowery, Fort Worth, CO - "This was one of the best tours I have been on. The guides were fantastic--very informative and helpful. The quilt festival was fabulous and the rest of the tour just icing on the cake." Natalie Friedman, Lewisville, TX - "As a long-time traveler, compulsive pre-planner, and control freak, I had some anxiety about giving up all that planning and control for this trip. As it turns out, I didn’t need to worry. Craftours did a wonderful job of doing the planning and worrying for me! It was a very pleasant and enjoyable experience to be able to relax and go with the flow, and still have a great travel adventure!"